There are many different arch supports on the market. Like everything else, some are better than others. And one brand might work well for your feet while another brand works well for your friend’s feet. Quality off-the-shelf orthotics usually cost $40.00 – $70.00. Below are the arch supports we recommend to our patients (and our families) and they are also affiliate links so we may receive a small commission at no additional cost to you if your order from the link. For the most support in full-size athletic and walking shoes use the FootChair Podiatrist Designed Adjustable Arch Orthotic. 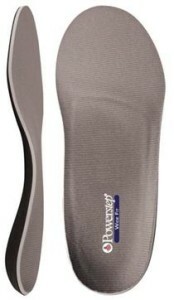 This unique orthotic has a very supportive arch along with an adjustable arch via pads that can be inserted under the cover. For lace-up shoes this arch support is the most supportive and the best choice for heel pain, arch pain, ball-of-foot pain and big toe joint pain. 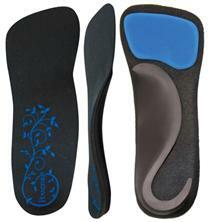 These OTC orthotics incorporate many features otherwise found only in custom orthotics and run usually under $39. We can also modify these in our clinic to make them work even better for your specific foot problem. For smaller shoes such as soccer, bike shoes or women’s causal shoes, we recommend the PowerStep 3/4 length Orthotic which has excellent arch and heel support and are available in the $40 range. While these fit in a wide variety of shoes, they won’t fit in women’s flats or pumps. You can find orthotics for women’s dress shoes here. For people with flat or wide feet, the PowerStep Wide Full Length Orthotics are the widest prefabricated orthotics we have found. If you have a foot above a D width, you may want to give these a try. If your feet are extremely wide, however, custom orthotics are usually a better option. We also recommend this arch support for people with very flat feet as flat feet almost always splay significantly and standard width orthotic thus tend to be too narrow. For dress shoes, including high heels, the Powerstep SlenderFit Fashion orthotic provides the best dress shoe support we have found in a prefabricated orthotic that will fit in women’s dress shoes. It has excellent arch support but is cut very slender and it even flexes in the heel so it can adapt to many different heel heights. Our recommended flip-flops and sandals with arch support are from Vionic. Vionic Sandals and Vionic Slippers offer exceptional arch support in a wide variety of styles. All of them have a well-shaped arch designed by a podiatrist. They are a great choice for wearing around the house, particularly if you have hard wood or tile. The arch will reduce tension on plantar fascia, transfer pressure off of the heel and the forefoot and help reduce painful forces in the big toe joint. You can find Vionic sandals and flip flops here and Vionic slippers here.